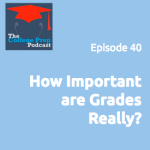 Good grades are the focus of everyone in education — students, parents, and teachers. The elusive A is everyone’s goal. But is this focus a help or a hindrance in terms of learning effectively and getting into college? During this episode Gretchen referred to this video by Dan Siegel about the impact of screens on our sleep. Also, sign up for Gretchen’s weekly video tips to help students de-stressify school, and for Megan’s weekly tips for the college application process.